Q: I have been trying for months to find an answer to my submenu problem using your FAQ and Recent Questions. The only thing that comes close to an answer is from one of your Recent Questions below, but I don't understand the answer. Will you please give me specific code or info to fix? Please refer to my frameset code and data.js info, which I've provided further down this message. 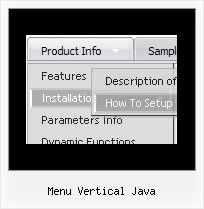 I am using cross frame menu dropdown. I have three frames: Top, Left and main (middle). I'm a newbie in WWJ and also Java programming. Follow the applet examples ... What should I do in order to change the vertical exaggeration? When I upload pictures with java, horizontal pictures (landscape) are fine, but vertical pictures (portrait) are broken. .... Phoca Download, Phoca SEF, Phoca PDF, Phoca Maps, Phoca Restaurant Menu, Phoca Email, Joomla!